Use this tag to post a userscript that operates on Stack Exchange sites and/or uses the Stack Exchange API. For questions about user scripting and Stack Exchange, or its API, use the scripts tag instead. See this moderator's post for the history of this distinction. Note: You may see certain posts linking to userscripts in 2 ways: 'view source' (or similar) or 'install'. 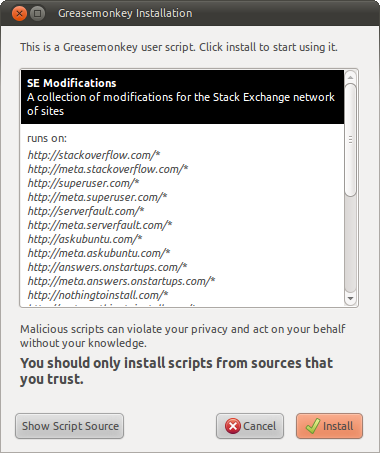 Clicking 'view source' will let you do just that, and clicking 'install' will cause Tampermonkey to detect it and let you install it from a simple, user-friendly screen (shown in the above screenshot). Look for the confirmation at the bottom of your browser and click Continue. 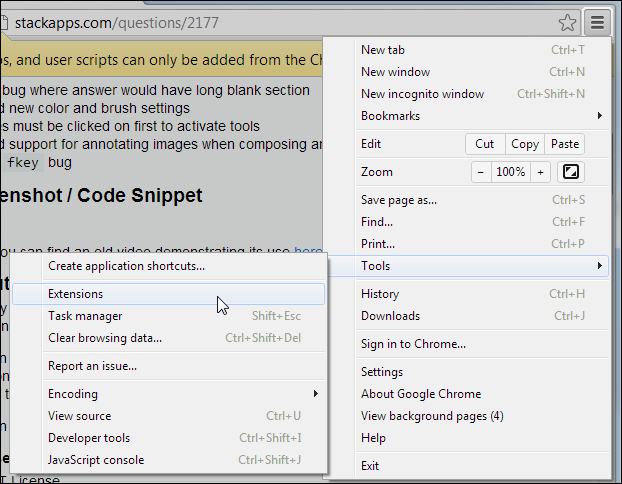 Chrome will warn you that you can't install the script. Because Google has disabled the direct installation of extensions that are not downloaded from their Web Store, you'll have to perform a few extra steps before you can use the script. The script should have appeared in your downloads bar. If the file name is modified to <filename>.user (<number>).js, rename the file so it ends with .user.js. Note: If file extensions are not displayed on your system, the name has to end with .user. Drag drop the file from the downloads bar to the extensions page. If you had renamed it, drag-drop it from your file manager. Release the mouse if the text "Drop to install" appears. A dialog appears. Click Add to finish the installation. The script should now be installed. Refresh all tabs affected by the script to start using it. Click on the link to the .user.js file found in the post. Download and Install SIMBL – (From the SIMBL website), SIMBL, pronounced like “symbol” or “cymbal” enables hacks. In other words, you can “patch” Mac applications to add functionality to them. Next, download GreaseKit. To install it, drag the GreaseKit.bundle file to ~/Library/Application Support/SIMBL/Plugins. If you don’t have a SIMBL/Plugins/ folder, just create it, then drop GreaseKit.bundle into it. Click on the link to the .user.js file found in the post to install the userscript. Go to the NinjaKit homepage. The page is in Japanese, but don't worry—the install link is in English. Click on the "NinjaKit for Safari" link. If you are prompted to open or save the file, select open. If the file automatically downloads, find the downloaded file (NinjaKit.safariextz) and double-click it. When Safari pops up a message confirming you want to install NinkaKit, click install. Install the TamperMonkey extension, which makes installation simple and easy. Within Opera, go to Tools > Preferences. Click Content in the choices on the left. Select the userscripts folder created in step 1. and click OK.
Click on the link to the .user.js file and save it to the userscripts folder created in step 1. Refresh the tab(s) affected by the script to start using it. Greasy Fork - a site to host Greasemonkey scripts.